Heavy-duty framework is durable and easy to clean. Sturdy wheel structure minimizes wobbling. Elevating footrests can be locked in place or swing away; padded calf pads. Chair has full-reclining back with head support. The back features unlimited adjustments using easy, finger-triggered hinge and cable mechanisms. 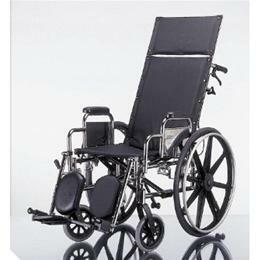 This model comes with a higher back and removable, full-support headreast. Chair comes in Blue upholstery. Burgundy and Black upholstery available as options.